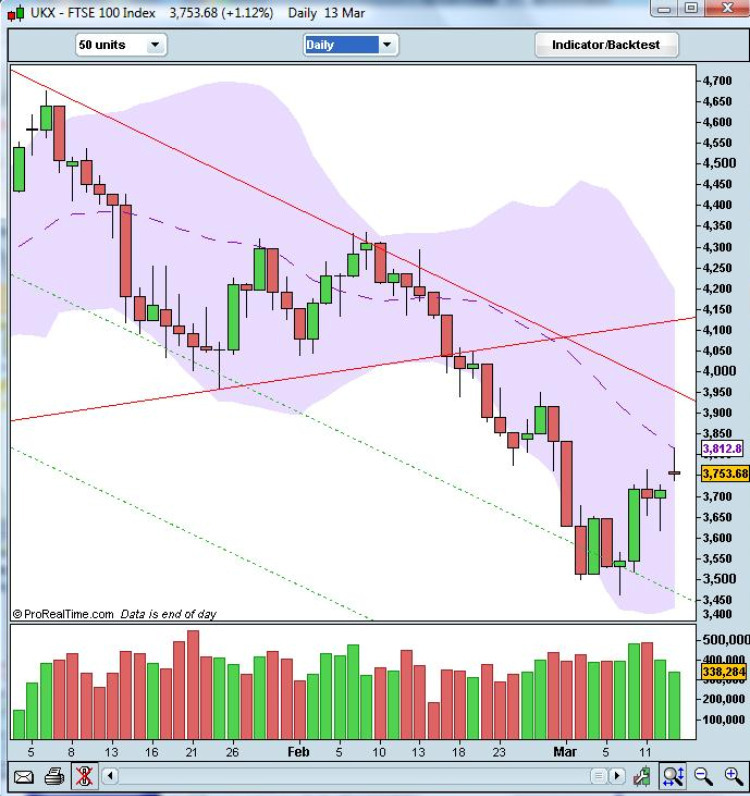 Following the hammer reversal signal we saw in the daily FSTE 100 chart on Monday last week, we are now seeing a mirror image of this reversal being repeated on Friday, with a gapped up shooting star showing signs of weakness in the move up, and we are therefore likely to see a fall in the index the early part of this week, offering us opportunities for a binary bet on the index. There are several factors in the chart which suggest we are likely to see a fall. First, the candle on Friday is gapped up, and should prices fall on Monday then we will have a classic morning star pattern, an excellent signal that a reversal is possible. Secondly, if we look at the volume, we have a move higher but with falling volume, which is a warning signal. For those of you who use volume spread analysis in your analysis, you will know that the professional money ( the market makers in other words) are not joining in the move upwards, and have simply marked the market higher before dropping it further, leaving all the bulls high and dry – a classic market making move! Finally the price move on Friday failed to pierce the resistance level at 3780, falling back lower to close the week at 3753. My suggestion is therefore to place a binary bet this week on the FTSE falling possibly to retest the lows of last week in the 3500 region once again. For the latest live news or fundamental new on the economic calendar please just follow the links. I have also added commodity prices, stock charts, live currency charts, and the latest currency news on video for you which is updated three times a day.